As 2018 comes to a close, the diplomatic process between North Korea and the United States that began earlier in the year is effectively logjammed. In the weeks and months since the June 12 Singapore summit, which was no doubt historic for the simple fact that it brought North Korean leader Kim Jong Un together with U.S. President Donald Trump, the two sides have become bogged down in familiar challenges. Sequencing and concessions have proven difficult and the two sides have yet to constitute a working group-level process. Diplomacy has taken place at the sole level of the leaders’ (on June 12) and between U.S. Secretary of State Mike Pompeo and his North Korean counterparts, United Front Department head Kim Yong Chol and Foreign Minister Ri Yong Ho. Of course, the text of the Singapore declaration says nothing of the sort—and neither do the inter-Korean Panmunjom declaration of April 27 or the inter-Korean Pyongyang declaration of September 19. Kim agreed to work “toward the complete denuclearization of the Korean Peninsula.” This Thursday, a Korean Central News Agency commentary attributed to the pen name Jong Hyon sought to disabuse the Trump administration of the idea that “denuclearization” meant what it thought it meant. When we refer to the Korean peninsula, they include both the area of the DPRK and the area of south Korea where aggression troops including the nuclear weapons of the U.S. are deployed. When we refer to the denuclearization of the Korean peninsula, it, therefore, means removing all elements of nuclear threats from the areas of both the north and the south of Korea and also from surrounding areas from where the Korean peninsula is targeted. This should be clearly understood. 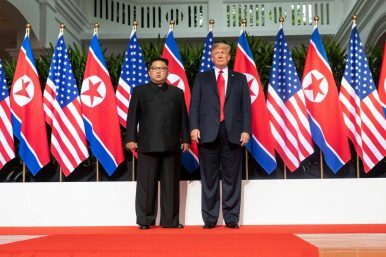 From the North Korean side, this is Denuclearization 101: the basis for a productive diplomatic process with the United States, building on a word that has effectively carried the same meaning from Pyongyang since its introduction to the diplomatic playbook in 1992, when it first appeared in an inter-Korean agreement that year. The historical context matters here as well. When North and South Korea first concluded an agreement to attain the “denuclearization of the Korean Peninsula,” North Korea was not yet a nuclear weapons power and U.S. tactical nuclear weapons had left the Peninsula just weeks earlier, in the final moments of 1991 following U.S. President George H.W. Bush’s unilateral nuclear reductions worldwide after the collapse of the Soviet Union. But the “nuclear threat” itself remains in North Korea’s eyes as long as the United States extends deterrence to Seoul and Tokyo. North Korea has left the specific conditions for the end of what it sees as the United States’ “hostile policy” ambiguous, but this ambiguity allows it to shift the goal posts as necessary. For instance, the end of extended deterrence alone may be insufficient. Pyongyang’s interpretation of “complete” denuclearization may be as maximalist as including global nuclear disarmament; in this sense, the removal of the U.S. nuclear threat could only come with the United States disarming itself. In the context of ongoing diplomacy, however, the message to be taken from Thursday’s KCNA commentary is that denuclearization diplomacy has to be a two-way street. The commentary was released shortly after U.S. special representative for North Korea Steve Biegun arrived in South Korea. Biegun announced that the U.S. would review its travel ban to North Korea for humanitarian groups—a concession of sorts. North Korea has grander ideas about concessions, naturally. Beginning in September with Foreign Minister Ri Yong Ho’s speech at the United Nations General Assembly in New York, Pyongyang began making the case most explicitly since the Singapore summit in favor of sanctions relief for what it saw as its own compliance with the Singapore agreement.